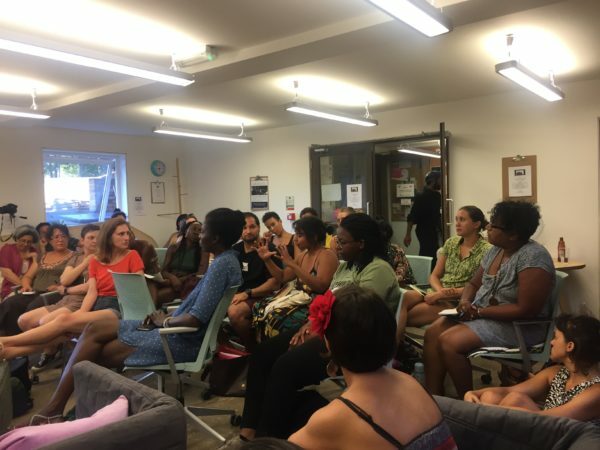 This summer, Community Food Growers Network held an evening of discussion on Gentrification, Food Justice and London for around 35 people at Impact Hub in Brixton. For many of us, reflections around the topic started with our journey to the event. Our journeys involved walking past the Brixton Arches where traders were recently forced out of their spaces due to Network Rail’s development plans, and through to Pop Brixton where ‘foodies’ were enjoying the taste of over-priced street-food in their idea of a ‘community project’. The event happened against the backdrop of regeneration-led evictions and community-led resistance; of families being forced out and corporate uniforms taking over; of tokenistic and exclusive ‘regeneration’ consultation processes in the area. The scale and very essence of gentrification was hard to miss. Featuring speakers and attendees from community food growing initiatives, anti-gentrification campaigns, local community members, community centres, various Network representatives, students, and activists, the event provided a space for conversations about food’s role in gentrification. In recent years, there has been a lot of focus on the benefits of urban agriculture and local food systems, including more green spaces in urban areas, social benefits, employment and training opportunities, and environmental sustainability. At the very least, the concept of the ‘alternative’ food movement offers an answer to the environmental, social, and economic challenges of the neoliberal capitalist food system. Yet, there seems to be limited understanding of how food initiatives interact with and impact the everyday realities of low-income communities of colour in London in which they are often situated. There are food system localisation efforts happening in London and across the world, but what is becoming apparent is the lack of consideration in these efforts for pre-existing economic, social and cultural relations of power and privilege existing both among and within localities. Who can afford to buy local, organic food? Who can afford to grow it? Is urban food growing used by estate agents and councils to increase the “market value” of an area, resulting in driving out less wealthy and more precarious households? Our panel speaker Betiel Mahari gave an example of this in Brixton, where she became an accidental activist to save her own flat in Loughborough Park Estate when she was abruptly given an eviction notice by the Guinness Trust, with no alternative housing offered to them when the redevelopment plans started. Similarly, local businesses that have been operating for years in the area, some providing affordable culturally appropriate food are being shut down and will soon be replaced by the ‘organic’, ‘vegan’ cafes and bars culturally appropriating the food of marginalised communities but marketing it to the new wave of ‘trendy’ professionals arriving in the area with prices that local people cannot afford. The alternative food movement has a lot to offer against the current capitalist industrial agriculture system, however, power and privilege emerge through community food spaces and unless difficult realities are faced, the food movement is in danger of creating an ‘alternative’ food system that perpetuates oppression, instead of confronting persistent race, gender and class inequality. The panel reminded us that localised food systems are not enough and food projects cannot be removed from issues of concern to communities – gentrification being one of them. The event discussions made it really clear, there is more work to be done than merely localising food systems and changing habits. Those of us in the food movement need to have a willingness and commitment to do the work on systemic change based on an interrogation of power, privilege, access, inequality. How are we going to change the system so that excluded people have access to land and food? How do we reframe the conversation/process in order to engage those people? Those impacted the most by systems of oppression must be taking part in shaping answers and identifying solutions. It is not enough to want ‘local participation’ and ‘engagement’ from the community, as Farzana mentioned during the event – this is still embedded in power dynamics, and it is up to us to shift power and resources to uplift the issues crucial to that particular community. We need to listen deeply and begin by building trust. The event made it really clear – without addressing justice, food projects will not be successful, so how can we start planting social justice? I believe we need a deep analysis of power and privilege, and institutionalised inequity in the food system. We need to change organisation processes to ensure transparency, accountability, share power and responsibility. We need to transform our processes and ways of working and operating in communities. We need a better way of allocating resources. We need to repair historical trauma and shame caused by injustices. We need to see expressions of solidarity and movement building to work towards these change. There is no doubt, both the event and this article have left me (and probably you) with more questions than answers. But, it is ok to not have all the answers yet. I am hopeful by this crucial moment of reflection and action happening in the food movement, and I trust deeper answers will come when we make space to come together more regularly, eat together, connect with each other and collectively start to reimagine an alternative food system that holds itself accountable for its role in wider social justice issues, thereby moving us closer to an alternative food system rooted in real justice where power and resources are shared equitably. A special thanks goes out to: Zahra Dalilah (KIN Folk Network), Deirdre Woods (Granville Community Kitchen), Farzana Khan (Voices that Shake), Ian Solomon (May Project Gardens), Betiel Mahari for making a great panel, and Daniel Azavedo for feeding the revolution and everyone who co-created the space with us and provided further feedback for us to build on. Check out minutes from the event on our Facebook page, and look out for our future events around these topics.